Who wants my awesome Bidoof? What is there to say about this game that hasn't been said about others? What makes this Tales of game stand out? For one, I think the story is one of the better ones in the series, despite the fact that there are particular characters that I prefer. However, there are notable characters within Tales of the Abyss, and apparently Luke is considered one of the top 'Tales of' protagonists (though he falls short compared to Yuri Lowell). I don't want to speak too much for fear of spoiling those who haven't yet finished this particular gem, but the game follows the basic Tales formula, but like the previous games, tries to build on each of it's predecessors with some kind of exciting new thing. In this particular game's case, that happens to be FREE RUN(also the FOF system for arte enhancements, but I would suggest looking that one up in the game). Yes, you heard me. This was the first Tales game to allow full 3d movement across the battlefield, not having to stay in a particular line with the enemies. A few years ago, I remember using this to a particular effect while in multiplayer to take out an optional boss about 5 levels earlier than what should be recommended. Said ability allows you to play a sort of hit-and-run strategy against enemies when you are in full control, and is very helpful in the game's Colosseum. Yes, this game has that particular Tales staple, also the main character has a thing for the girl that can use Pow Hammer, something I've noticed also in Tales of Phantasia and Tales of Symphonia. Sure, in typical RPG fashion, the feelings aren't apparent, but they're hinted at (and in some cases are very blunt). This is one of those games that can also be referred to as "Jade's game" if you're ever in such an online discussion (the others are Assassin's Creed and Beyond Good and Evil), so you too can feel witty when the need arises! 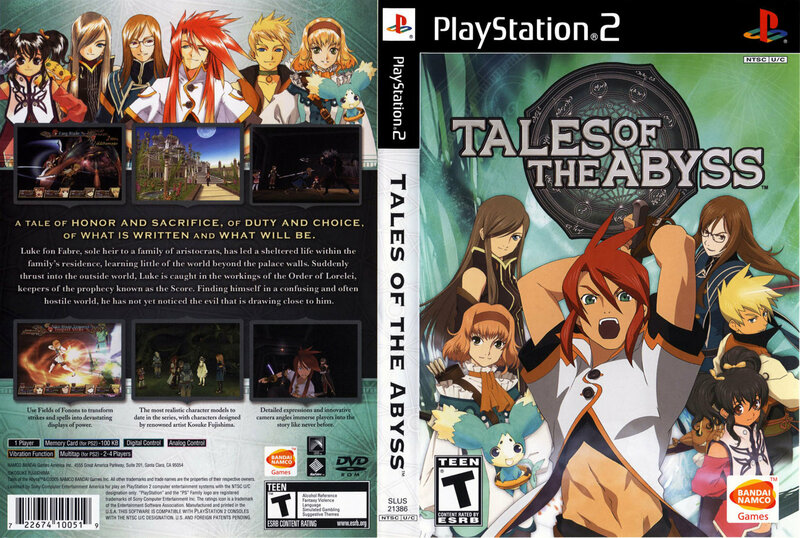 If you like the Tales series and have a PS2 (a certain part glitches on the PS3, making it unplayable), then you should give this one a go. If this is your first foray into the Tales series, it certainly isn't a bad one to start off with, but I would also suggest you check out the earlier titles if they are available. Verdict? Obviously BUY(or find someone with a copy and play it with them). Happy Tales!